Yeah, it was another time regression "gimmick" like she used in Green Darkness. But that's not what bothered me, I actually think it could have been a good story idea. And the dated-ness didn't turn me off, either. It was just so poorly written -- very amateurish and un-Anya Seton-like. It was her last book, so I'm wondering if she had just lost heart, or something. top tier - Green Darkness and Avalon. Middle tier Katherine, The Turquoise, Foxfire. I haven't experienced any bottom tier ones so far. Neither "Mistletoe and the Sword" or "Smouldering Fires" grabbed me, and I think it's because both were written for the YA market. The stories are quite slight in consequence and have a touch of that patronising tone that authors sometimes can't resist when writing for a younger audience. Ditto with Avalon, which was so boring I couldn't finish it. It astonishes me that a writer who could produce marvels like Katherine and The Winthrop Woman - some of the best historical fiction ever written - could descend to such depths. I'm so glad to see someone else mention THE HEARTH & EAGLE. It's one of my favorite Setons. It also employs the dual-time technique, with one central character (Hesper) being a descendant of another (Phebe). The New England Marblehead and seafaring atmosphere never ceases to enthrall me. There's a kind of sideways connection to THE WINTHROP WOMAN as Governor John Winthrop plays a part. I also love KATHERINE, GREEN DARKNESS and DEVIL WATER. 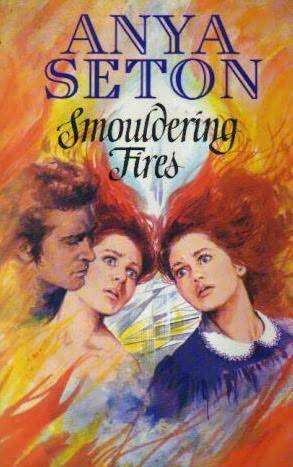 I hadn't even heard of SMOULDERING FIRES. Will have to try to find a copy, just for curiosity's sake. THE RED LILY CROWN: A Novel of Medici Florence. It will be interesting when the new release of Mistletoe comes out this year, will they mention that it was originally YA? It was a so-so read for me, but Roman Britain doesn't always thrill me either. I thought Hearth and Eagle was well done, but my main problem was that I didn't find myself caring for the main characters very much. I can live with that in say a Forever Amber kind of book but it didn't work well here. Still good. BTW, everyone knows that Historical Tapestry is planning to feature Anya Seton? I believe it starts on June 1. Could be wrong though. I actually like The Mistletoe and the Sword. Certainly not Seton's finest, but interesting and well-written. For the Hearth and Eagle, I can't really put my finger on why I didn't like it much; it was just blah and lacked spark. Elizabeth -- For Smouldering Fires, I really wouldn't waste your time or money (but that's just my opinion ). If I hadn't already disposed of my copy I would send it to you! Last edited by Michy on Mon May 24th, 2010, 8:23 pm, edited 1 time in total. Ack. I think I'm scarred for life. I will now take your sage advice and pass on this one. ha ha The copy I had had a totally different cover -- very sedate and 19th century-ish (or was that 18th century?). Anyway, this one is much more indicative of the quality of the book (or lack thereof). I'm glad you saw this so you didn't waste your time or money on it! It pains me to say that about an Anya Seton, but it is just true.